Slipcover linen is weighty, slubby, floppy and softly dimpled after washed. It’s strong and wears well. The look is imperfect and uniquely different than any other natural fiber fabric. Here are my favorites. This 100% linen is a classic. The strong 15 oz weight is perfect for slipcovers. Wash and dry your yardage to bring out the natural beauty. Like all linen, this one gets soft and crumpled when laundered. I like that it doesn’t lint or get hairy after washed. Shrinkage: 4″ to 5″ on a one yard length, 3″ on the width. Brazil Linen White 12 oz. and Off-White and many other colors. Manchester Linen Natural Brown 13 oz. This un-dyed, natural brown linen is a beauty! 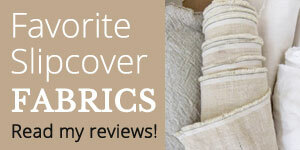 It’s also the most durable 100% linen I’ve found for slipcovers. Heavy weight and tightly woven, this fabric offers excellent coverage and is a good choice for slipcovers that get daily use. Like all linen, this one has moderate give. Low wrinkle (more of an overall soft crumple) when you wash and dry the yardage. Be sure to follow my pre-shrink instructions for best results. Shrinkage: 4″ on a one yard length, 3″ on the width. Hemp Canvas Natural 11 oz. This is a strong, tightly woven canvas in 100% hemp with the look and feel of slubby linen. I love its natural, rustic beauty and creamy un-dyed color. After washed, this fabric takes on a wonderful floppy drape and allover soft crumpled appearance, no hard wrinkles like cotton canvas.